The American educator Booker T. Washington said it best when he proclaimed: “If you want to lift yourself up, lift up someone else.” There are many great reasons for young people to volunteer. It helps them gain experience and an appreciation for the challenges that exist in this world, while at the same time growing their confidence as they see their actions make an impact. It’s no wonder that participation in volunteer programs has become part of a well-rounded student curricula. To help you find that perfect outlet for your charitable energies, beijingkids has put together a list of the best places to volunteer in Beijing. If your child is a hands-on kind of person, participating in a Habitat for Humanity project is a great way for them to build practical experience while working for one of the most well-respected charities in the world. There are four ways in which high school students can participate: building, fund raising, advocating and educating. 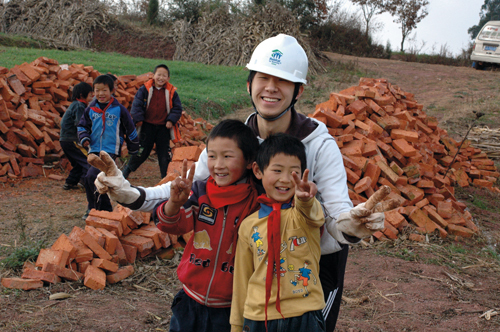 For those who want to build or repair houses, they can either participate in a local project or go on a Global Village Trip, designed to give students a cross-cultural experience. Currently, the only chapter in the Beijing area is located at the International School of Beijing, though any group of ten or more motivated change-makers can start one at their own school. events. The Global Village Trip is limited to students over the age of 15. To volunteer: Students should contact their local chapter for volunteer opportunities, or create their own chapter. A non-profit, Magic Hospital works with sick, handicapped, abused, orphaned and at-risk children in an effort to provide them with happy and healthy childhoods. For those who want to donate three to five hours per week, long-term internships in their offices are available. If spending time in the office clashes with class time, students can organize toy drives at their school. Bilingual students might also enjoy helping out with their “outdoorsy day” events and story-telling program. The only prerequisites are that kids are responsible for their own actions, have a sense of community spirit and believe in the Magic Hospital mission statement. Age requirements: Flexible, but students must exhibit a high degree of responsibility. To volunteer: Volunteers should contact the Magic Hospital to be added to their database of volunteers, or to find out about setting up a drive at school. The Beijing office of Roots & Shoots, which was created by the Jane Goodall Institute China, provides a platform and support for young people who want to create activities and projects to protect the environment, animals and the community. One of the great benefits of volunteering for Roots & Shoots is that young members have the opportunity to attend leadership development programs and meet Jane Goodall on her annual trip to China. Students can volunteer by creating a group and sharing their appreciation for our planet with others, or by helping out in the offices either full- or part-time. They are also looking for volunteers for their annual Roots & Shoots Summit on September 24, so there’s no time like the present to join! To volunteer: Volunteers need to find an adult sponsor for their group and fill out an online application form. CAI and A Bridge for Children (ABC) recently joined forces, and are working both with migrant children and orphans to create a better future for them. There are two ways that students can get involved: either by volunteering as a teacher for CAI, or by becoming a student ambassador for ABC. Activities that young people can organize include fun runs, bake sales and sponsored silences. As an ABC student ambassador, children are responsible for making sure that their peers and teachers are aware of ABC’s mission and programs. Other opportunities are available, and students interested in contributing to the organization should submit their resume and a letter of interest. Age requirements: CAI/ABC prefers its teaching volunteers to be at least 18 years old, but will make exceptions for exceptional students. Younger students can become involved as ABC student ambassadors. Age requirements: There are no age requirements for fundraisers and student ambassadors. To volunteer: To create a chapter at their school, volunteers should contact CAI and ABC for further instruction. Students interested in other opportunities should submit a resume and letter of intent. Founded by the business tycoon turned animal savior Zhang Luping, BHAEEC rescues abused, neglected and abandoned dogs and cats, rehabilitates them, and puts them up for adoption. It offers several opportunities for teenagers to volunteer, including taking care of animals and helping out around the office. The center is also looking for volunteers to help promote their work to international organizations and potential donors, and gives preference to long-term volunteers. Anxious parents can relax: All animals are have up-to-date vaccinations and young volunteers are supervised by staff members. The only thing that can go wrong is that your young do-gooder comes home with a new best friend. address to volunteers. This is to prevent people from showing up unannounced. Age requirements: Teenage and adult volunteers are welcome. To volunteer: Volunteers should fill out the application form found on their website. BHAEEC prefers people who can come in groups. of breaking the poverty cycle: visit the website, spread the word, and make a donation. The best way to do all of these is to set up a Wokai team at school or to join another local chapter to raise funds and awareness for this world-famous microfinance non-profit. Currently, Wokai is looking for volunteers who are fluent in Chinese and English to join their Beijing headquarters. Volunteers would work on English-to-Chinese translations of their website and borrower profiles. Age requirements: Students of any age are welcome to join a local chapter. To volunteer: Check the roster of teams to find one near you (http://en.wokai.org/teams) or set up your own by visiting http://en.wokai.org/resources. China Care Foundation was founded in 2000 by a determined teenager dedicated to providing nurture and care to China’s orphans. Since then, the organization has not only provided medical treatments for countless orphans, it also created the Half the Sky Nurture Project, which provides education services both to local women and orphans. High school and university students are invited to create a local China Care Club at their school and host fund-raising events to fund life-saving surgeries for orphans. Active China Care Club members can also apply to spend ten days at the China Care Home in Beijing where they will be able to care for orphans who have just undergone life-saving medical procedures. Age requirements: None, but those wishing to volunteer for a ten day trip at the facilities should be actively involved with the China Care Foundation. More student and adult volunteer opportunities can be found at Lasso Guide to Charity in China’s website, lasso-china.org.